Welcome to Jyotish Sagar. Provide Astrological Magazines and Services. The company was incepted in 1997 at Jaipur. Our Authorized and reputed vendors helps us to grab maximum customer satisfaction. Effective solutions, reliable services and Focus on client privacy are the plus points of our organization. 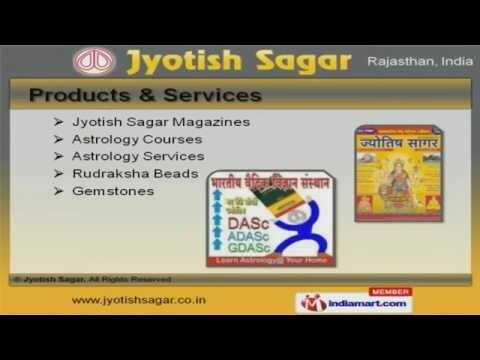 We offer a huge gamut of Jyotish Sagar Magazines, Astrology Services and Gemstones. Our Semi Precious Gemstones, Astrological Malas and Mercury Idols are extremely reliable. We also provide Astrology Books, Free Horoscope and Matchmaking that are widely appreciated in the market. Our Astrology Books on Predictive, Career and Horary Astrology are a class apart. Avail from us, a classic collection of Astrology Books on Remedial Astrology, Mundane Astrology and Vastu Shastra. The customer can place his own preference in terms of Electional Astrology, Astrology Books on Medical and Tajik Astrology.